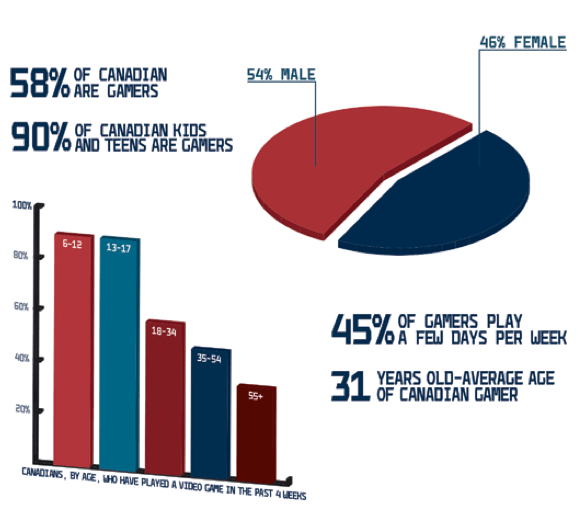 The Entertainment Software Association of Canada (ESA) released their Essential Facts 2012 (here’s the PDF) report not too long ago and it’s filled with fun facts! According to the ESA’s research Quebec has the greatest number of industry workers while Ontario is expected to have the fastest growth. The Globe and Mail picked up on the report and highlighted the fact that Canada’s video game industry is the third largest in the world right now. They also have a great breakdown and visualisation of the ESA’s report, you can view their presentation here.